DJing vinyl vs digital: Which one is the best for modern DJ’s? 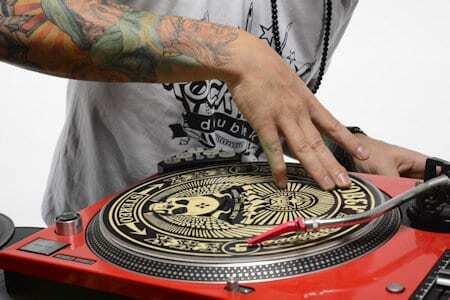 Scratching is sometimes seen as the most difficult part of DJ'ing and turntablism. Learning how to scratch can be a slow process, but we're about to learn all you need to know to get you scratching like a pro as fast as possible! When I was learning, I lost my social life for about 2 months. But once you perfect it, it's really worth it. When you know how to scratch the crowd will react totally different to your set. And once you've finished playing you'll almost always get compliments on your scratching. It's really a great way of showing the crowd, you have something different. I meet up with so many DJ's, either at clubs, or guys I have known for years. And I rarely come across another DJ that knows how to scratch. Even DJ's that have been in the game for 15 years plus. I have tried to teach some of these guys and they could definitely do it.. They just don't commit the time to perfecting each scratch. Learning how to scratch is all about practice, practice, and more practice. Keep practising until you have a scratch routine that will work perfectly in your sets. Scratching originally comes from cueing up a vinyl record. Grand Wizard Theodore discovered it. He was playing some records in his room and his mum was speaking to him. As he was talking he didn't want to lose a certain part of the record. So he stood there moving this one part backwards and forwards whilst chatting. While he was moving the record he heard the record making a scratching sound. He thought, wow this sounds really good. So he then just started messing with it, and scratching was born. Scratching is like the DJs vocal over an instrumental. You can use it just like talking to the crowd to hype them up. It's also a great way of showing off and showing the crowd what you're made of. When we scratch words we tend to make them stutter. If I'm scratching the word Break, it'll become brea-br-b brea-br-b brea-br-b-b-break. And I can do this to whatever beat I like. I tend to scratch random sounds more though. Like the popular freshhhhhhh sound, as this works better over the genres I play. What equipment do you need to learn how to scratch? If you already have a DJ set-up this is simple. There's only two different things that you'll need if you want to learn how to scratch. You'll need a mixer with a good crossfader curve. If you're using a club orientated mixer there will be a fade point on it, where you fade the one deck into the other. You don't want this, you want a crossfader that's straight open and really sharp. Most modern mixers have a crossfader adjust knob. If you have this, you should be able to get the perfect curve to scratch with. Adjust the curve so just a millimetre of movement will fully open the fader. You'll also need some decent scratch sounds. If you're scratching using vinyl you can get a scratch record which will be full of samples. Burn them onto a CD or get them ready in your digital software and get ready to learn the most simple scratches first. You should always start learning how to scratch using these three simple scratches. The baby scratch. The most simple scratch to learn is a baby scratch. Whether you're using CD's, a controller, or vinyl the principles will be the same. If using vinyl you will stick a marker on the centre of the vinyl. This marker will be a reference point to where the sound begins. You can line this up with the tone arm, or anything else on the turntable. If you're using CD decks you may have a display in the centre of the jog wheel will have a marker that will serve the same purpose. Most controllers should also have this, or you may be able to find it on screen in the deck section of your software. Find the start of the sound and move it back and forth. Do this first without a beat, once you are happy add some music. This scratch should be easy to perfect and does not need the use of the crossfader. The scribble scratch. The scribble scratch is a modified baby scratch. Use the exact same technique but just move the record faster, double time or triple time. The drag scratch. With the start of the sound cued, open the fader. Move the sound back and forth from the 9 O'clock position, to the 12 O'clock position. Again do this without a beat first and then add some music. This may seem very simple but you'll need this skill to progress to more complex scratches. Like I mentioned earlier, these are foundation scratches. Learn the basics of how to scratch using these. Perfect them, and then step up the ladder a little by learning scratches like 1 or 2 click flares. Keep progressing and learning new scratch techniques. This is quite an old video (so please excuse the quality) of me scratching with vinyl. I made it to demonstrate a few different scratches that work with most genres of music. Watch the video, and then we'll break down each one so you can try it for yourself. So in the video I was using chirps, babys and 1 click flares. You can see how these simple scratches can add something great to your set. Chirps should be the first scratch you learn where you incorporate the crossfader. Cue the record with the crossfader open. Push the record forwards and you just want to hear a small amount of the sound. As you hear it begin, close the fader. Drag the record back and open the fader. So your doing a simple baby scratch with your record hand, but cutting off the sound with the fader right as the sound begins. This is called a chirp as it sounds kind of like a bird chirping. We've already covered the baby scratch so 1 click flares are the next scratch to learn. So with the fader open push the record forward, just like a drag. Half way through the sound use the fader and cut the sound in half with a simple click of the crossfader. This makes 2 sounds out of the one. Drag the sound backwards and cut the sound in half again. So in all you have 4 sounds, this makes a fairly simple scratch sound complex. You'll find this scratch quite hard to speed up, but stick with it and it'll sound great over any genre of music. You can switch it up and add in two clicks or if you have fast fingers, even three clicks. When I was learning how to scratch, I found the above scratches fairly easy to learn. It gets more difficult when you try to speed them up and put them to a beat though. Why can't many DJ's scratch? I think the reason I meet so many DJ's that haven't learned how to scratch is simply because of the amount of time and commitment it takes to perfect. Maybe it's also a genre thing..
Hip-hop DJs feel the need to incorporate scratching into their sets as it's what the genre has been built on. DJs of some other genres like trance probably don't. But don't let this put you off, scratching is awesome. It's a natural progression in DJing and everybody should learn how to scratch. It might not work with your genre, but you could start mixing more genres. Find a genre that you like that will allow you to incorporate scratching into your set. So once you perfect the scratches we've spoken about today, try mixing them up. Add in fader clicks, move the record in different ways to make it sound different every time. As you're learning these scratches just think of the end result, being able to scratch during a set in a club. Seeing the crowd go nuts for a DJ that has something different to everybody else they've watched that night. And knowing that you're throwing something different into your sets. This will make promoters want to hire you. This will motivate you to spend the hours learning each scratch, and to become a scratch master. When you're first learning how to scratch you could try recording your scratch sessions. This will help you to learn where you're going wrong. Or it could help you find what works the best with your genre. If you haven't recorded your sets before a simple program like Audacity works perfectly. Don't be afraid to mix it up and develop your own unique style, and just have lots of fun with it. You've now learned the basics of scratching, but have you perfected your mixing yet? Read my essential guide to mixing here. Pingback: The top 12 advanced DJ tips and tricks - Give yourself the edge!